The Award Winning Cachaças of Espirito XVI. When it comes to crafting a beautiful cachaça, purity and simplicity are hallmarks for which there are no substitutes. It is this fundamental principle that guides every stage of our distillation process as we transform hand harvested sugarcane into Espirito XVI Cachaça. SUGARCANE is the heart and soul of any cachaça. As such, the quality of the cane and the manner in which it is harvested often means the difference between a beautiful cachaça and a mediocre one. HARVESTED BY HAND and grown locally, painstaking effort is made to ensure that the sugarcane used to craft Espirito XVI Cachaça remains pure and untouched by soil. This is in stark contrast to many other cachaças which, in an effort to maximize production at the expense of quality, mechanically harvest their cane from fields that have been set ablaze in order eliminate wildlife that may interfere with their ability to quickly collect as much as possible. FRESHLY PRESSED reeds of cane yield a sweet nectar which is then collected and quickly introduced to the fermentation process. Reducing the amount be time between harvest and distillation means that Espirito XVI Cachaça does not have to pasteurize its cane juice, a process that significantly compromises its integrity and diminishes its natural complexity. PRIVATE MOUNTAIN SPRINGS located on the distillery’s rainforest estate provide Espirito XVI Cachaça with an abundant source of crisp, clean water. NATURALLY FILTERED AND DEMINERALIZED, these exclusive springs give rare access to water that is unparalleled in its purity and cannot be found anywhere else in the world. PERMANENT NATURE PRESERVE is the distinction given to the site of the springs, which are nestled high in the distillery’s mountainside farmland at an altitude of 1,200 meters, ensuring that the water’s purity will be maintained for generations to come. DOUBLE DISTILLED IN SMALL BATCHES, Espirito XVI Cachaça is handcrafted using custom alembique copper pot stills from Europe. 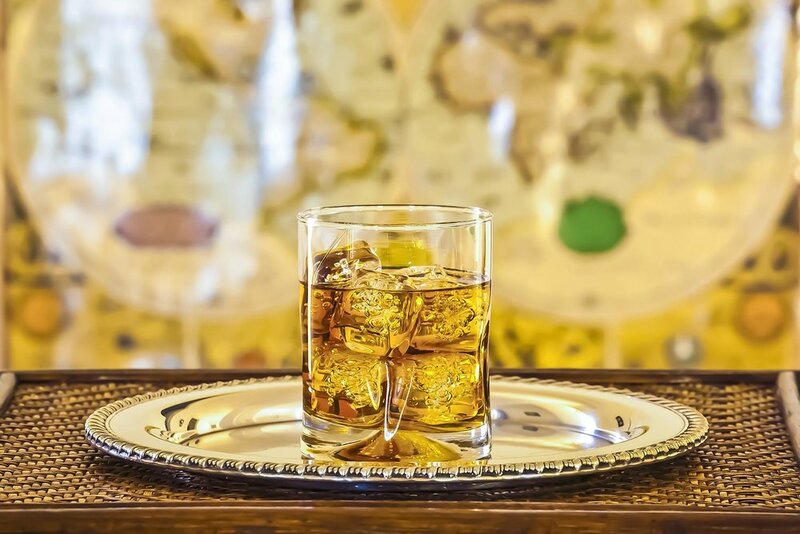 While expensive and difficult to maintain, copper is exceptionally good at conducting heat and removing sulfur compounds which means it has no equal when it comes to producing high-quality premium spirits. THE SMOOTHEST, MOST FLAVORFUL portion of the distillate -known as the heart- is all that is extracted for bottling. In order to achieve this difficult task, tremendous care is taken to isolate the heart at precisely the right moment. CAREFULLY RESTED in stainless steel casks for six months, Espirito XVI Cachaça is then cooled to 0° Celsius and introduced to to a double charcoal filtration process that refines this beautiful spirit even further. We regard cachaça as a canvas for the imagination and, much like a painter or poet, seize every opportunity to use the power of our craft to tell new stories and alter perspectives. With its exotic origins and layers of depth and texture, nothing embodies this thirst for creativity and innovation more than Espirito XVI Dourado. 28 DIFFERENT TYPES OF TIMBER can be used to age cachaça, giving it nearly limitless potential for innovation while adding character and complexity to a spirit already known for its remarkable versatility. COMPLEXITY AND CHARACTER are two of the most important attributes gained by a spirit when it’s introduced to the aging process and Espirito XVI Dourado is an exquisite example of why this time consuming process is worth the wait. A DENSE AND DEEP-RED HEARTWOOD has gained the Brazilian Balsamo tree a reputation for being difficult to work with, but the rich golden hue and complexity of flavor bestowed by its beautiful color and naturally aromatic oils more than justify the extra effort. AGED FOR UP TO TWO YEARS in timber harvested from the Brazilian Balsamo, Espirito XVI Dourado embodies the most desirable characteristics of this exotic wood. HAND SELECTED staves of Brazilian Balsamo wood impart notes of caramel and honey that are perfectly balanced by the clean, smooth finish for which Espirito XVI Classíco Cachaça - the foundation of this aged spirit - is so fondly known. HIGHER PROOF than most aged cachaças, Espirito XVI Dourado allows for the full breadth and depth of its complexity to be enjoyed. The hallmarks of a great spirit are the same as those of a great story. They juxtapose the familiar with the foreign to heighten understanding. They blend anticipation with uncertainty to create drama. They remind us of who we are by showing us who we could be. To hear Cavaleiro’s story is to discover the beauty created when spirits from two distinct cultures embrace their differences and find harmony in their similarities. Known for its remarkably versatility and unique flavor profile, Cachaça is not only the quintessential spirit of Brazil, but also the third most consumed by volume world-wide. Aged for a minimum of one year in hand selected Kentucky bourbon barrels, Cavaleiro the balanced embodiment of two of the world's most cherished spirits. Awarded Double Gold and Best of Show honors at the 2017 WSWA Tasting Competition, these distinctions represent a resounding affirmation of the remarkable flavor profile and superior quality of this exciting and innovative spirit. With fewer than 500 cases produced annually, each bottle is filled, labeled, and numbered by hand. Every batch has its own unique personality and flavor profile.